Two straight weeks of taking two of three games in a week last season might have been taken by some Washington Capitals fans as a bit of a disappointment. This season, it is progress. It says a lot of the differences between that team as this one, but it is progress, and that is the theme that underlies this season for the Caps on a week-to-week basis. The Caps put together a winning week for the second week in a row, the first time this season that they posted consecutive winning weeks. And, the week included a convincing 4-1 win over the hated Pittsburgh Penguins in what might have been the most complete Caps effort on home ice this season. However, it was not what one would call a convincing week. The Penguin game might have been the outlier, as the Caps struggled to subdue the woeful Arizona Coyotes in overtime, 3-2, and that after spotting the Coyotes a 2-0 lead less than seven minutes into the game. The Caps followed that game up with a 3-1 loss to the Buffalo Sabres in what might have been their most somnambulistic effort of the season, even if it did feature a bout of fisticuffs. But ending the week on a high note with a win over the Penguins never gets old or cliché. The Caps recorded eight goals in three games for the second straight week, and it was worse than it looked. 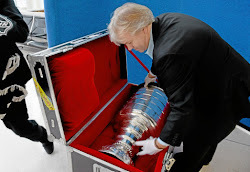 That Washington managed just three goals in two games against the teams – Arizona and Buffalo – that finished the week ranked 31st and 28th in scoring defense, respectively, has to be something of a disappointment. Not that the Penguins are any better, finishing the week 29th in scoring defense, but the Caps did score three on them with the benefit of a goalie in net. 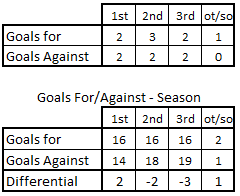 Alex Ovechkin and John Carlson each had a pair of goals to account for half of the goals scored in Week 6. Carlson’s goals were especially timely, the first of them being the overtime game-winner against the Coyotes to open the week, the second of them giving the Caps an early lead they would not surrender to the Penguins to close the week. Carlson led the team in points for the week (2-2-4), while Evgeny Kuznetsov led the team in assists with three. Carlson’s four points and Lars Eller’s two (both assists) put them in double digits in points for the season, the fifth and sixth Caps to hit that mark. After allowing 111 shots on goal in three games in Week 5, the Caps cut that total to 86 shots on goal in three games in Week 6. Progress. Yes, the Caps did it against three teams that finished in the bottom ten in scoring offense for the week (Pittsburgh: 24th; Buffalo: 30th; Arizona: 31st), but you can only play the opponents on the schedule, and the Caps did a good job of holding down the chances with that group. It was part of a broader improvement in shot suppression for the Caps, who finished 11th in the league in shot attempts-for percentage at 5-on-5 (52.07; numbers from NHL.com). It might seem modest, but for a team that finished Week 6 in 22nd place in that statistic (48.35 percent), it was improvement indeed. On an individual basis, the five goals scored against the Caps with a goaltender in net were fairly clustered among a few who were on ice for the misfortuen. Lars Eller and Madison Bowey were on ice for four of those five goals scored; Jakub Vrana, Brooks Orpik, and John Carlson were on ice for three apiece. The Caps had two portions of good and another of unlucky at the goaltending position in Week 6. Braden Holtby started and ended the week with wins, his fourth and fifth wins in a row after going 4-3-0 in his first seven appearances. He had a save percentage for the week of .944, lifting his save percentage over his five-game personal winning streak to .939, quite an improvement over his .913 in his 4-3-0 start to the season. Holtby reached the 200-win mark in his career in his 319th career game, and the added benefit was his having done it against the Pittsburgh Penguins. He became the second fastest to 200 career wins in NHL history, only Montreal’s Ken Dryden doing it more quickly, in 311 games. Impressive? Not to Holtby, perhaps, but yeah...impressive. The “unlucky” was Philipp Grubauer, who took the loss in his only appearance in Week 6. He was superb in the first period of the 3-1 loss to Buffalo, stopping all 15 shots he faced (by way of comparison, Holtby faced a total of 13 first period shots in his two games for the week) with an otherwise sluggish team in front of him. As it was, stopping 29 of 31 shots should have been good enough for a win, but it merely extended a period of frustration for the netminder, who has stopped 66 of the last 70 shots he has faced (.943 save percentage), dating back to the third period of the 6-2 loss to Vancouver on October 26th, and he has nothing to show for it in the win column. 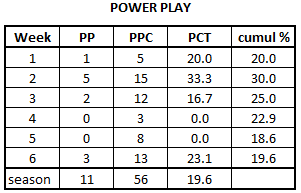 Going 3-for-13 for the week would not elicit much of a reaction if this was the 2016-2017 season, but the 23.1 percent week was the second-best week for the power play, efficiency-wise, since Week 2 (33.3 percent) and the second-best week of the season to date. It was another case of the Caps making hay when the sun shined on comparatively weak penalty killing squads (Buffalo was the highest ranked of the three teams the Caps played with a 15th-ranked 81.3 percent penalty kill), but a whole season is built on facing weak and strong teams. You could say that the Caps got balance from places they needed it. The three power play goals in Week 6 were scored by Alex Ovechkin, John Carlson, and T.J. Oshie, critical elements on the top power play unit. Evgeny Kuznetsov had assists on two of them, also a welcome development. While the overall efficiency (shots per minute) was not quite up to the power play’s effectiveness (3-for-13), it was a case of what happened in wins and what happened in losses. In the two wins, the Caps had 17 shots in 20:05 of man advantage ice time; not great, but not bad. And, it was in those games that they scored all three power play goals for the week. In the loss to Buffalo, the Caps managed just one shot on goal on their lone power play. Not many opportunities there, and they didn’t take advantage of the one they had. 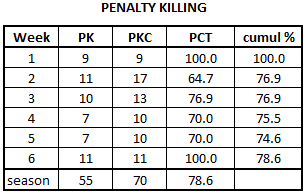 Penalty killing was perhaps the highlight of the week from a team standpoint, the Caps going perfect in three games, their longest streak of shutting out opponents’ power plays so far this season and their first perfect week killing penalties since going 9-for-9 in Week 1. Yes, Buffalo and Arizona are weak power play teams, finishing the week in 28th and 26th place, respectively, in the power play rankings. But Pittsburgh was a top power play unit, especially on the road (they finished the week second in road power play efficiency: 31.9 percent). It was an efficient penalty kill as well. Over the three games, the Caps allowed just 14 shots on goal in 19:56 of shorthanded ice time. What the Caps could have used less of was shorthanded situations late in games. Four of their 11 shorthanded situations came in the third periods of games, two of them against that high-ranked Penguin squad. It is not the sort of situation the Caps are looking to include in a recipe for success, but it is hard to quibble with the results in Week 6. 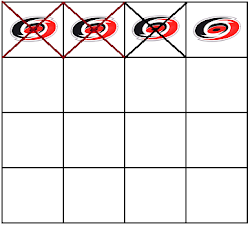 It was a good week overall in the circle, and the success tracked with the wins and loss, the Caps going over 50 percent against Arizona (58.6 percent) and Pittsburgh (56.7 percent), and finishing under 50 percent in the loss to Buffalo (48.3 percent). What was a bit off was the performance in the offensive end, where the Caps finished the week at 48.4 percent, primarily on the 5-for-18 effort (27.8 percent) against Buffalo. In fact, the 18 offensive zone draws, when compared to the draws in the defensive end (24 in all, of which the Caps won 12) was an indicator of how little the Caps pressed matters in that end compared to the other two games of the week. On an individual level, Jay Beagle was superb, winning 20 of 41 draws overall (73.2 percent) and being beastly in the defensive end, where he won 16 of 22 draws (72.7 percent). 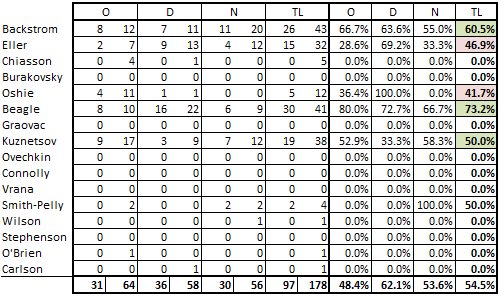 Of the other four Caps to take at least ten draws for the week, Nicklas Backstrom (26-for-43/60.5 percent) had a fine week, a winner in all three zones, over 60 percent in both the offensive (66.7 percent) and defensive (63.6 percent) ends. Evgeny Kuznetsov was at 50 percent for the week, continuing what is for him an up-and-down year. His 42.1 percent for the season is 106th of 117 skaters taking at least 100 draws this season, but that’s ok; it is the same percentage as Evgeni Malkin and better than Connor McDavid (40.6 percent). 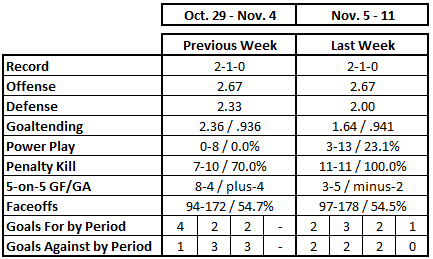 It was a reasonably balanced week insofar as goals scored and allowed by period was concerned for the Caps. The Caps got off on the wrong foot against Arizona to start the week, allowing a pair of first period goals, but then they did not allow another over the first 20 minutes in the other two games of the week. The Caps also showed some improvement late in games in Week 6, allowing only two for the three games. They still finished the week having allowed 19 third period goals, tied for ninth-most in the league, but it was a welcome improvement. 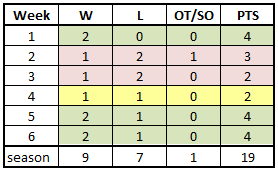 In an odd statistical result, the Caps finished the week as the only team having scored an equal number of goals in each of the regulation period played – 16 in each of the first, second, and third periods of games. Week 6 was something to build on for the Caps, making progress and inching up in the standings, snatching victory from the jaws of defeat in one game after spotting an opponent an early lead to open the week, and smacking a rival convincingly to end it. It was not a week without its anxious moments, and the middle game of the week against the Sabres was a disappointment. But the watchword for a team with so many new moving parts that got younger to start the season is “progress,” and the Caps certainly made that in Week 6.